Imagine living along the shores of a beautiful, expansive waterbody but fearing it due to pollution and contamination. Imagine your city, one which you lovingly call home, dismissing these waters as forever unswimmable, lost to decades of development and neglect. Now, imagine yourself standing along that same shoreline 20 years later, bathing suit on, about to jump into that waterbody without hesitation, but with exuberance and joy. It’s a feeling we can all imagine, perhaps have even experienced, as we work towards an era of reclamation. This summer the Swim Drink Fish movement will celebrate its biggest achievement to date. 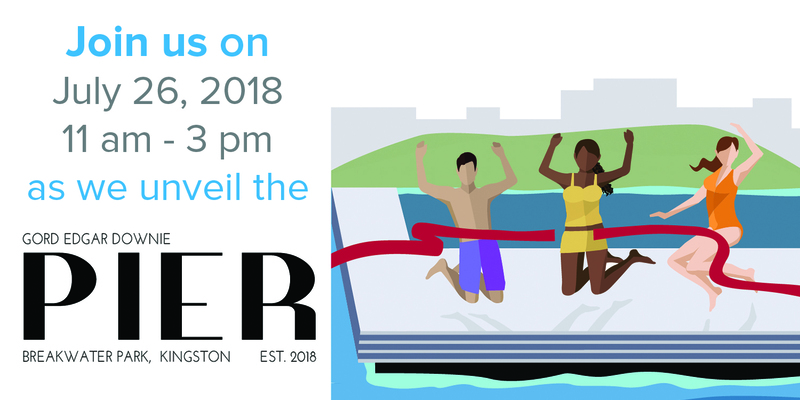 On July 26, 2018 in partnership with the City of Kingston, Ontario and The W. Garfield Weston Foundation, we are officially opening the Gord Edgar Downie Pier at Breakwater Park, Canada’s first deep water urban swimming pier. This project is the culmination of over 20 years of work, transforming a deteriorating shoreline into an accessible public swimming area. By doing this, you’re celebrating the Gord Edgar Downie Pier and everything he did for the Swim Drink Fish movement. But you’re also celebrating your local waterbody and the gratitude you have for it. And together, we are celebrating the right to swimmable, drinkable, fishable waters. The City of Kingston, Ontario is located just a couple hours east of Toronto along the shores of Lake Ontario. A university town, Kingston is home to a vibrant community of people who love their beautiful city. But for decades, due to industrial development and lack of foresight, the Kingston waterfront was not used as a place for the community to recreate. Sure, people swam there, but it wasn’t widely considered as swimmable. In 2001 the swim, drink, fish movement was started in the creation of Lake Ontario Waterkeeper, and one of their initial undertakings was to work with the City of Kingston to change this. This undertaking dovetailed with the creation of the Kingston Waterfront Master Plan (KWMP), a multi-year, multi-project plan developed at the grassroots level to restore and reclaim the Kingston waterfront. As the movement evolved, and Swim Drink Fish became the banner under which we operate, the Kingston waterfront became the perfect location to enact the sort of localized, community based restoration we so deeply believe in. This is our biggest restoration project to date, and it is truly emblematic of our vision. Even more special, it bears the name of one of Canada’s most beloved and celebrated artists, Gord Downie. Known by many as the lead singer of the Tragically Hip, Gord was also heavily involved in the Swim Drink Fish Movement. He was an ambassador of the organization, and was instrumental in helping get Swim Guide off the ground in its earliest days. What does this mean for swimmable waters? This project is truly a celebration of what our movement stands for: connecting people with water. Not only is this the first urban deep water swimming pier in Canada, but it is also the first fully accessible one, allowing people of all abilities to enjoy the feeling of getting into and connecting with water. Our hope is that this story, one of restoration and reclamation, one built around the belief that a place once dismissed can become a place forever celebrated, helps inspire you to get out, on, or in your local water. If you’re able to attend the unveiling in Kingston on July 26, or just want to learn more about it, visit the event page here.